Since late Shang and early Zhou the temple had this structure. 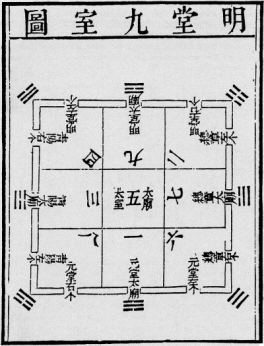 In the centre the realm of the supreme sky god, in the Heavens the North Star, through the axis mundi connected with the Middle Kingdom, in the temple the central room. Ming Tang: bright hall. Qing Yang: blue solarium. Zhong Zhang: assemblage of decor. Xuang Tang: dark hall. The halls at the corners have two thrones and windows on two sides, they are occupied by two months, the other halls by one month. All together the twelve months of the year, or the twelve palaces. Every month the emperor presented the sacrifices in the appropriate hall, with the appropriate attributes, colors and prescriptions of that month.